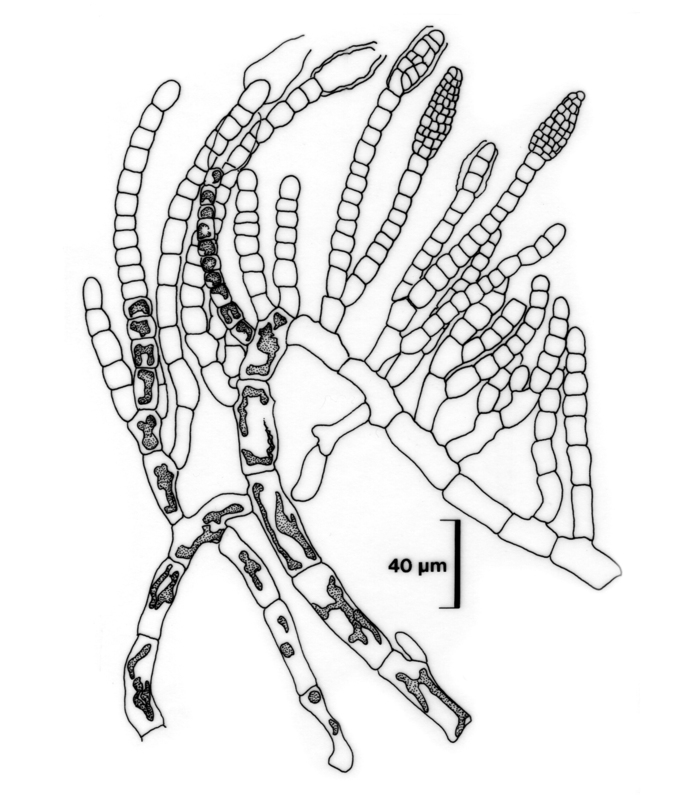 Plants minute, mainly endophytic (in Codium), comprising tufts of protruberant filaments arising from basal system of branched filaments that intertwine between cortical utricles of host. Cells of endophytic system elongate, ca. 10-15 µm in diameter, to 5 times as long as broad, giving rise to assimilatory filaments of similar diameter, ca. 10-15 cells long, protruding from the host tissue and tapering slightly at their tips. All cells approximately isodiametric with one or two irregularly-shaped parietal chloroplasts. Plurilocular sporangia multiseriate, terminal on assimilatory filaments, to 45 µm long and 15 µm in diameter. Found on Codium (e.g. C. papenfussii ). Recorded from Betty’s Bay on the west coast to the Knysna area (19-30). World distribution: Also recorded from Japan (Guiry & Guiry 2011). Type locality: Knysna, Western Cape Province, South Africa (Silva et al. 1996). Streblonema codii, stained microscope slide. 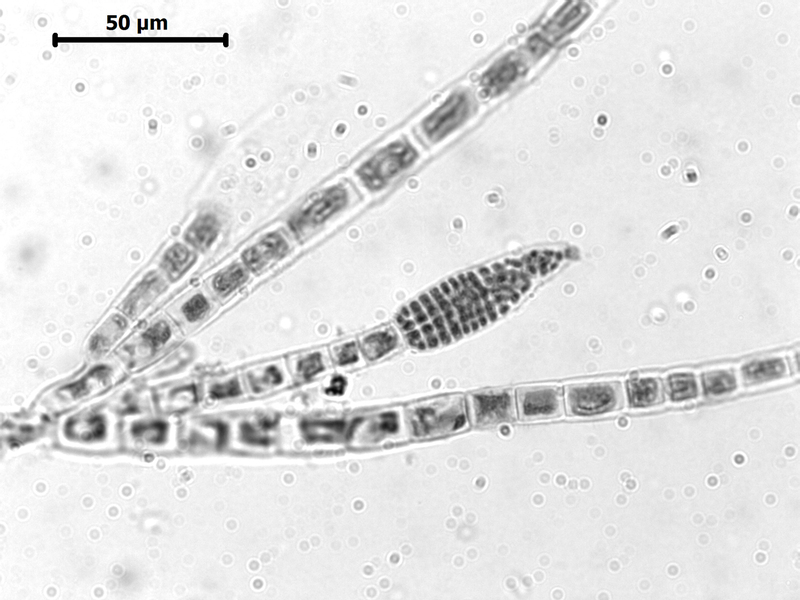 Streblonema codii, detail of protruding assimilatory filaments and plurilocular sporangia. 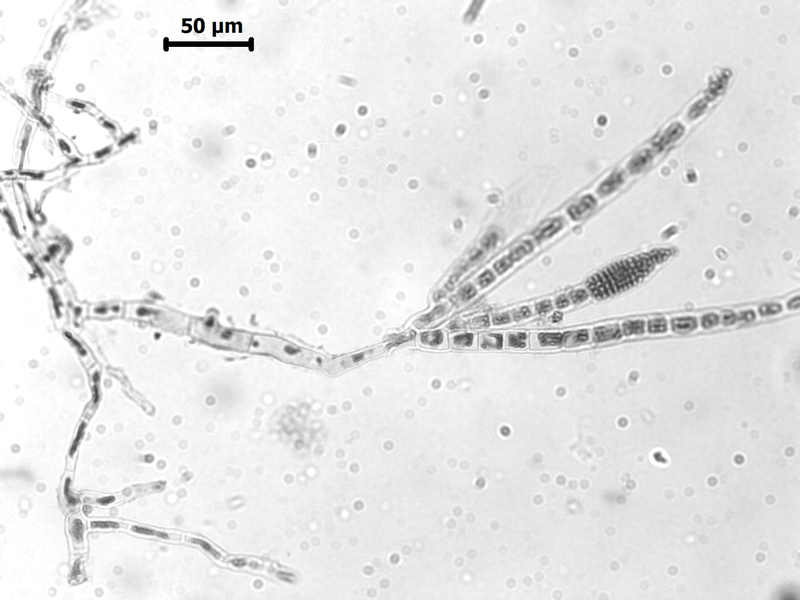 Streblonema codii, microscopic habit with protruding assimilatory filaments and plurilocular sporangia (reproduced from Stegenga et al. 1997). Barton, E.S. (1896). Cape algae. Journal of Botany, British and Foreign 34: 193-198, 458-461, 5 Figs. Guiry, M.D. & Guiry, G.M. 2011. AlgaeBase. World-wide electronic publication, National University of Ireland, Galway. http://www.algaebase.org; searched June 2011.